In recent years, several major integrated oil companies have sold off certain refineries they own because they don’t believe they are positioned to be core to their current business practices. We thought it would be interesting to examine some of these large companies as they continue to turn their focus to upstream assets, and divest their refining segments. Integrated oil companies are those with positions in exploration and production, refining, and retail and marketing. In the last 20 years or so, major oil companies have been moving away from the concept of being fully integrated. This trend began with selling off their retail service stations. They came to realize these business were not making them any money, and decided to sell them to independent retailers who were licensed to represent their brand. The divestment trend has since moved up from retail and marketing to the refining sector. The profit margins in refining have always been small compared to exploration and production revenues. Major oil companies have been focusing on their high margin upstream businesses, and decreasing their refining investments. 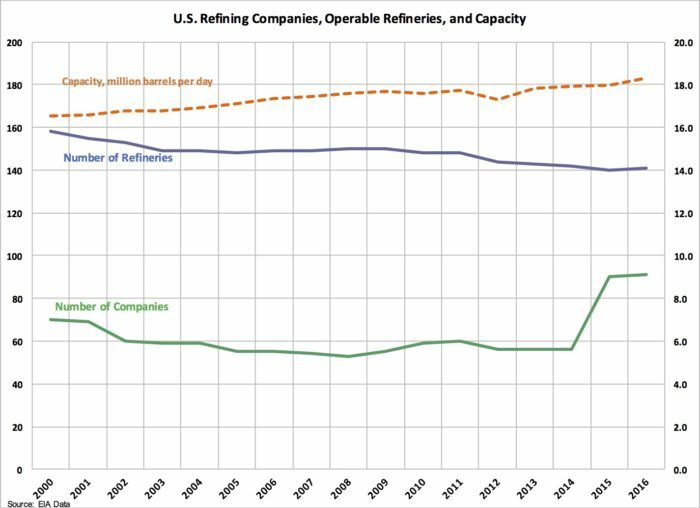 As a result the landscape of U.S. refinery ownership has changed significantly since 2000. In April 2016, Chevron sold their Kapolei refinery in Hawaii to Island Energy Services LLC, a subsidiary of One Rock Capital Partners. The refinery sale was due in part to Chevron’s goal to divest noncore holdings. Chevron is also rumored to be selling refineries in British Columbia and South Africa, continuing the divestment of their smaller refineries. Interestingly, they are not selling their Salt Lake City refinery most likely because of its proximity to Utah’s low priced Uinta production basin. In September 2015, ExxonMobil sold their Torrance, CA refinery to PBF Energy. According to Jerry Wascom, president of ExxonMobil, “The sale resulted from a strategic assessment of the site and how it fits with our refining portfolio. We regularly adjust our portfolio through investment, restructuring or divestment consistent with overall global and regional business strategies.” The fact that the Torrance refinery wasn’t a money maker for ExxonMobil despite being integrated upstream with equity heavy oil production is another likely reason for the sale. PBF Energy also purchased the ExxonMobil’s Chalmette refinery in Louisiana in 2015, making PBF North America’s fourth largest independent refiner. In an effort to help cover costs related to the 2010 Deep Water Horizon disaster, BP sold its Texas City, TX refinery to Marathon Petroleum in 2012, and its Carson, CA refinery to Tesoro Corporation in 2013. BP most likely chose these two refineries because the two plants did not have good access to cheap Canadian crude. Shell is rumored to be selling its Martinez, CA refinery and according to an article in the East Bay Times, has enlisted the help of Deutsche Bank to help find a buyer. The capital the refinery needs to earn in order to meet upcoming California environmental standards has not been made, making this the most likely reason for the potential sale. As major oil companies continue to focus on their upstream resources, we expect to see more refinery and related asset sales in 2017. Stillwater has deep experience and expertise in assisting transportation fuels companies with mergers and acquisitions, and we look forward to keeping you informed as the North American refineries continue to change hands.